Originally, the town was known as Zion. A post office was granted in the late 1870s. Zion had a variation of the all-too-familiar story of �railroad arrives � move town� � but in this particular case the rails were only a quarter of a mile (south). New development had the same effect and the older part of town was eventually abandoned. The change in name came about when Eli Smith donated land for a church and community cemetery. For his generosity, Eli became the town�s namesake. A fire in 1890 did a considerable amount of damage but by 1990, Smithfield had a respectable population of 137 and a solid reputation as a shipping point. 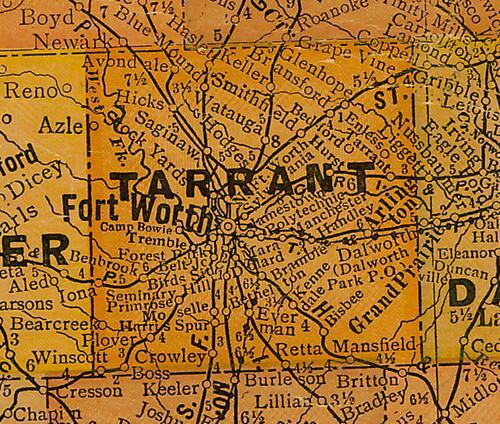 The population of Smithfield remained small until WWII when Fort Worth built factories. After the war, the population was around 350. Smithfield held its own until 1958 when it was annexed by North Richland Hills. The name Smithfield remains on the cemetery and a historical marker placed there � as well as several local businesses.